Fig. 60 New product development. 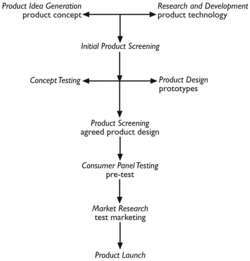 Steps in the process of developing a new product. product technology generated by the firm's RESEARCH AND DEVELOPMENT department or licensed from outside the firm. product design to make product prototypes and test them in a laboratory situation. The results of these two processes will then be subjected to further screening on marketing, technology and cost grounds, and a product design will be agreed upon for product ideas which survive the second screening. In order to test further both consumer acceptability and the operating efficiency of the product design, prototypes may be distributed to a consumer test panel for their use and results collected from them. Feedback from this pretest can then be used to make final modifications to the product design if the basic design proves to be broadly acceptable. Finally the firm may undertake extensive MARKETING RESEARCH into the potential market for the designed product, establish pilot production facilities for it and test market it in a limited geographical area in order to gauge consumer reaction. If TEST MARKETING proves successful then full-scale production facilities will be created and a full product launch undertaken, backed up by appropriate advertising and sales promotion. A very high proportion of new product ideas are eliminated by the firm through its screening processes. Despite this only a small proportion of those surviving new products which are launched succeed in establishing themselves in the market. See CONCURRENT ENGINEERING. We've created a new product development mandate in the company--woven into the fabric of the company. This press release contains forward-looking statements concerning profitability, working capital, new product development and marketing activities. IRI), the leading global provider of enterprise market information solutions for the consumer packaged goods (CPG), retail and healthcare industries, to launch a unique tool that is positioned to reduce the cost of new product development. As CTO, Vishnepolsky will continue enhancing 24/7 Real Media's existing technology platforms while driving technological innovation for new product development. Socrates will be the exclusive legal content provider, including new product development and consumer support, for both retail and Web-based sales. ENOVIA MatrixOne is focused on helping companies across the automotive, aerospace & defense, consumer, machinery, medical device, semiconductor and high-tech industries solve their most challenging new product development and introduction problems. We are excited at the progress we are making on new product development," Jaeger said.